Most consumer level microphones will only record in one channel of audio (mono), so it is just a waste of space to record that input to a stereo recording, you don't gain any new detail in the audio and it will sound exactly the same as a mono recording when played back. That said, there are microphones available that do record two channels. If you require this, you can set the number of channels to record under the Edit -> Preferences -> Devices menu for the specific device that will support multi-channel recording. More common than having a single device that records in stereo, is having multiple devices recording different sounds. 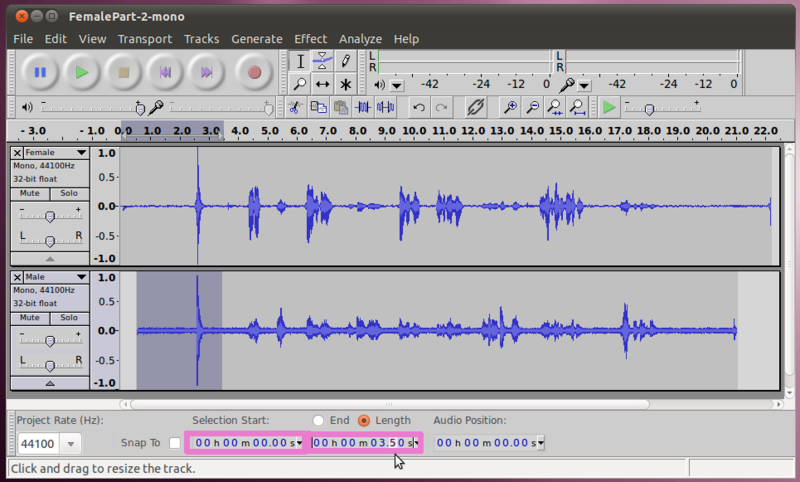 An example could be a radio or tv talk show where the host is one channel of audio, and each guest has their own channel of audio. 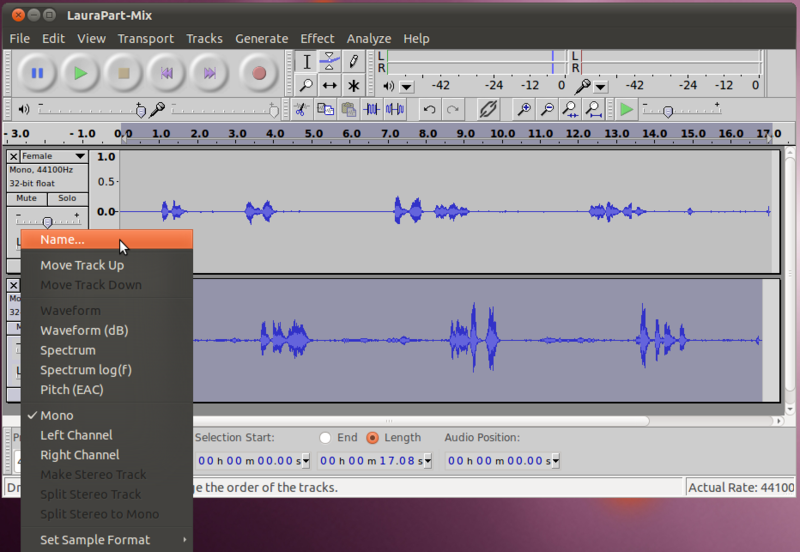 Another example would be recording a band playing, where each musician and/or instrument has its own track of audio. 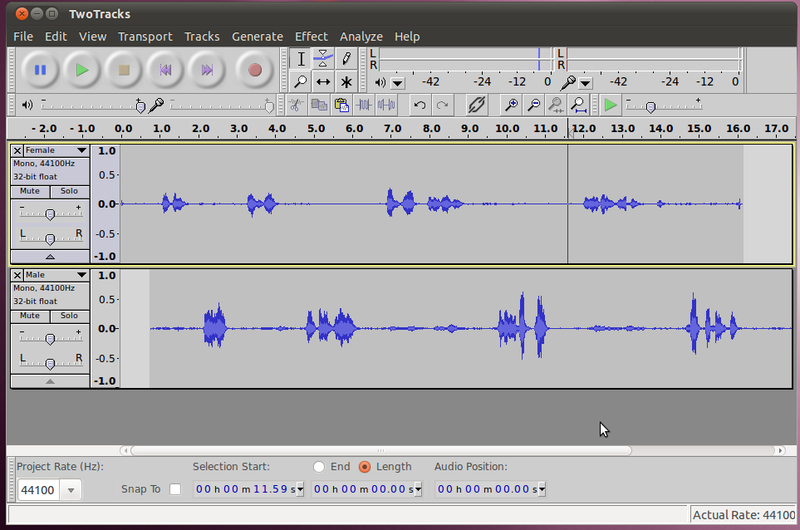 There are ways to record this in audacity (with the help of the JACK audio routing software on linux), but we won't go into them here. Instead, we'll start with a scenario where there are several independent tracks of audio that have already been recorded, and need to be edited together into one piece of audio. F: How are you doing? M: I'm fine, how are you? F: Fine as well. What are you doing now? M: I'm reading a book, why? F: Do you want to go to the zoo with me? M: Sure, that sounds fun. H: Estoy bien, y tu? M: Estoy bien tambien. Que haces ahorita? H: Estoy leyendo un libro. Por que? M: Quieres ir al parque zoologico con migo? Once you have the first clip open in audacity, open the second one by going to File -> Import -> Audio... and selecting the second clip from your hard drive. Now they should both be open, try playing them back together by pushing the play button. You'll notice that they don't line up. The two subjects are talking over each other. 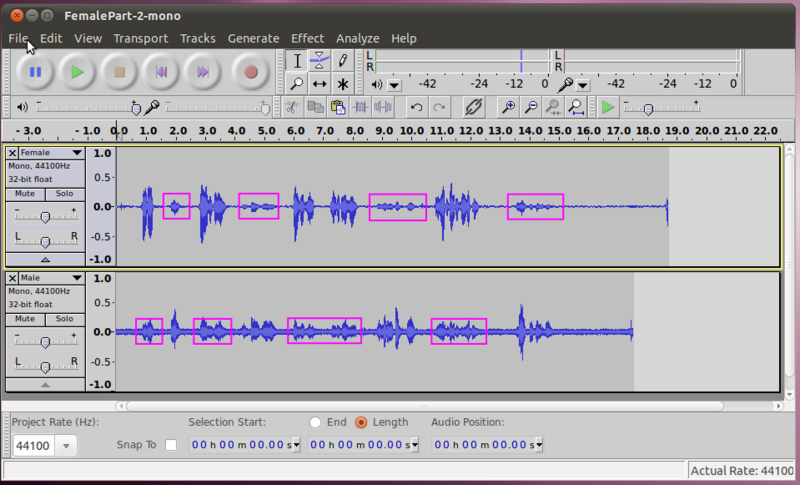 This is a common occourrence when recording multi-track audio, as each track may not start the recording at the same spot. To fix this we will have to synchronize (sync) them manually. But before we do that, lets give these tracks names so we can keep track of them (this is even more important when you have lots of tracks), to do this, click on the drop down arrow for the track, and select Name. For the female track name it "Female" and for the male track, name it "Male". In addition, now would be a good time to save the audacity project as a .aup file and directory. 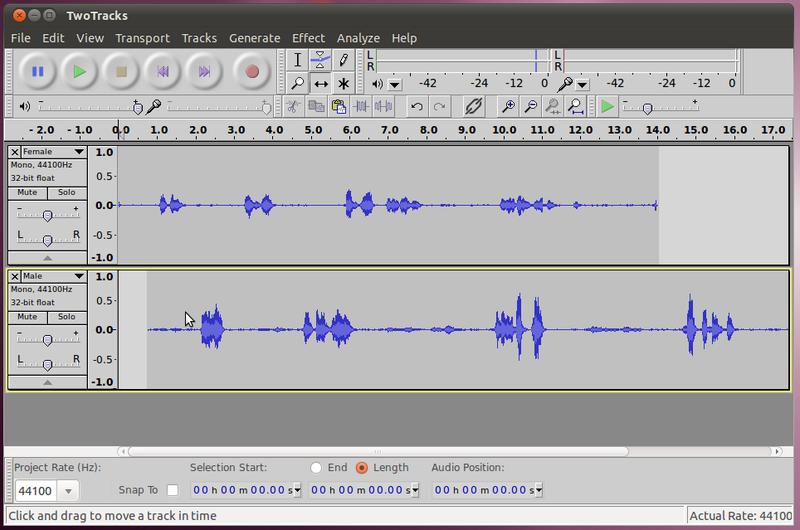 Now we're ready to sync the audio so that the final result has the two subjects talking to each other at the correct times. 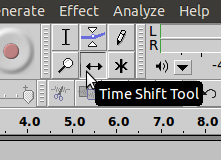 Select the Time Shift Tool from just below and to the right of the selection tool. Then it is as simple as clicking on the track you want to move, and dragging it to the correct spot. In this case, lets move the male track (because the female track talks first). 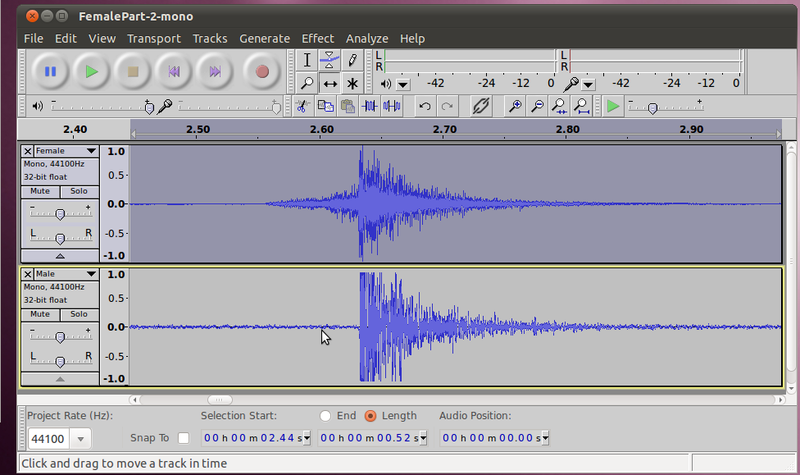 Just move it so that on the waveform the first male response lines up in the gap between the first and second female responses. If you try playing it back at this point you will notice that it starts out lined up, but then later on in the recording it gets out of wack. There are several possible reasons this could happen, but in this case it is because these tracks were done in two separate takes, with only one person's voice being recorded each time. Because they had no frame of reference the same tempo wasn't kept both times. To fix this, we will have to add in extra space to the blank areas to make up the difference. Simply click at the spot where you want to add space to put the cursor there, the select Generate -> Silence, then type the number of seconds you want to add (try something small like 0.5 to start with, you may need to select a different option from the drop down to pick a unit that has fractions of seconds, such as hh:mm:ss+hundredths) and click OK. Listen to the result to see if it sounds better, if it needs more go back and do it again. Repeat for each section that doesn't line up, moving from left to right in the two tracks. If you were to start at the right and move to the left, each change you made would throw off those that you had done previously. Another way to sync audio is to do it from the beginning. This time the two subjects were recorded in the same take, from two different microphones. You can download the two separate tracks here and here. When you play them back, you'll notice that they both have a loud sharp sound towards the beginning. This sound was intentionally made (can be done with a professional clap-board or just by clapping your hands once) so that the two tracks could be synchronized starting at this point. Its easy to synchronize them now. Just zoom in on the part with the sudden sound, and move the tracks with the Time Shift Tool until the sound matches exactly. 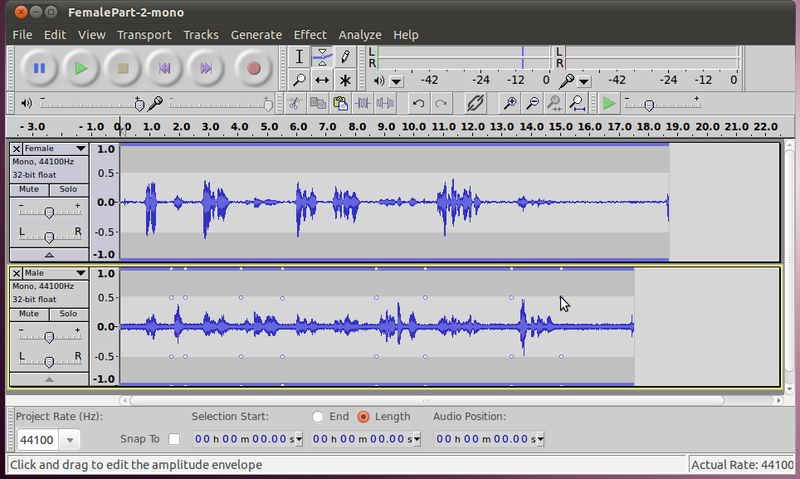 Now (or when you're all done with your other editing if you prefer) you can cut the exact same amount (use the selection editor at the bottom, select zero for the start and the same length in both tracks) of sound off the front of both recordings. This will give you a starting place that is after the clap. It was only there for synchronization, and we don't want it in the final recording. To make sure you get the exact same amount of the front cut off both, use the selection editor on the bottom (with hundredths of seconds) and then use the cut button (or Ctrl+x). You may have noticed that in some cases the male microphone picked up the female talking and the female microphone picked up the male talking. This is a fairly common occurrence. We want to remove this, because if the same audio shows up at a time that is even a split second different, it can drastically change the final audio (possibly sound like an echo or reverberation). Below are the areas in this clip where this is happening. One way to fix this would be to use the "Silence Audio" functionality that we used in the last section. Its usefulness is obvious here, if we were to simply cut out the additional audio from the tracks, their duration would change, and it wouldn't be possible to match them up. 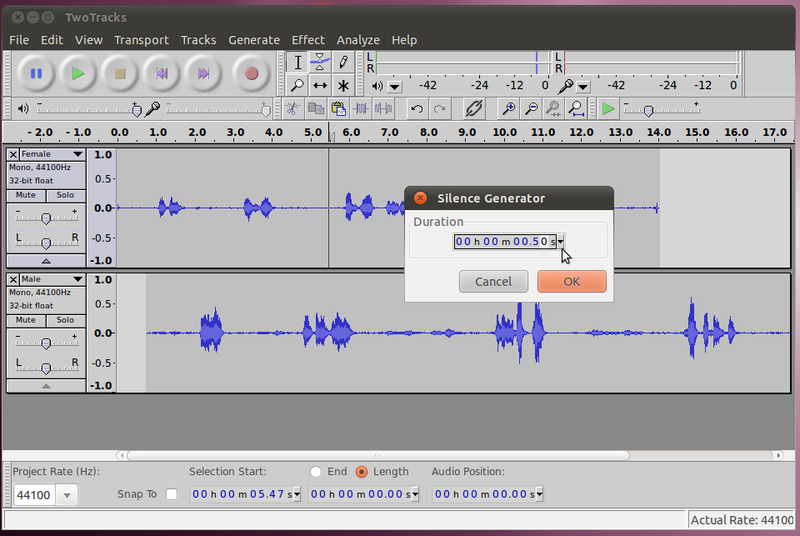 Instead, we can go, select each area and then run "Silence Audio". Another option to fix this would be to use the Envelope Tool. The Envelope Tool allows you to create a graphical envelope around the waveform which indicates the volume for that area. This allows you to simply turn down the volume only for areas that we don't want to hear, while leaving other areas normal. To apply it, switch to the Envelope Tool, immediately to the right of the selection tool. The envelope tool works by applying control points to the volume at specific points in time. Each time you apply a control point by clicking on the waveform, it creates four handles that allow you to adjust the volume. The four control points adjust the levels for 100%, -100%, -50%, 50%, of the volume. You can grab any of these points and move it up or down to change the volume level at that point. If you leave the 100% point at the top of the graph or the 50% point at the middle line nothing will change. 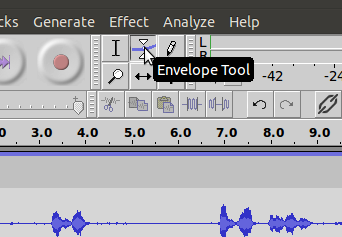 The first thing I do when I start using the envelope tool is to set control points (that aren't going to move) for the portions of audio I don't want to change. Here are the "fixed" control points, applied to the male voice. After the fixed points are applied, its easy to take the envelope down to zero in sections between them. Just click on it to create a control point, and drag it all the way down towards the center. As you drag it down, you will see the envelope form a curve from your new control point, up to the control points around the good audio, giving you a smooth transition (this is more important if you aren't completely silencing the audio). Here are the results after the envelope tool has been applied to silence the other sounds out of the male track. The envelope tool is even more useful where you want to constantly change the levels of sound for different tracks relative to each other. For instance if you have a band where each instrument is in its own track, it is easy to use the envelope tool to lower the sound from the drums during a portion of the song where you want the soloist to come through clearly. Now that we have two good tracks, one for each speaker, we can set them up to output a stereo track that has one person talking from each channel. That would make it sound like one person is taking from the left and the other is talking from the right. 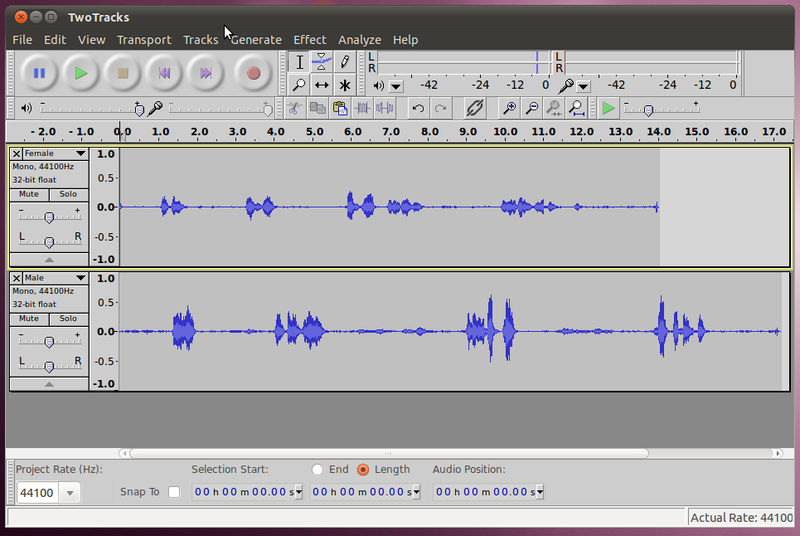 Audacity is smart, in that when it exports the project, it will automatically create a stereo file. All we need to do is control how much volume comes out of each channel for each track. 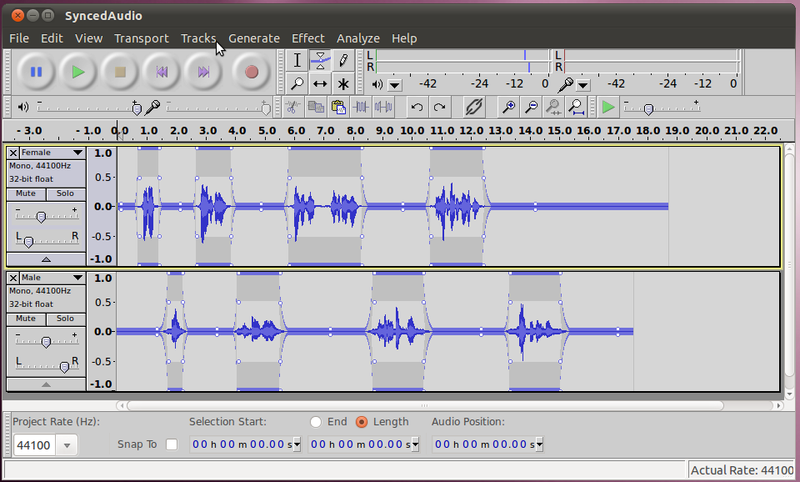 In the tools for the track, to the left of the waveform, there is a slider with a L and a R on it (for Left and Right). 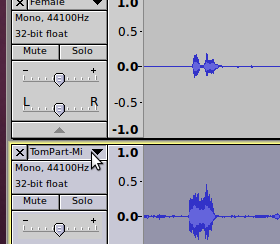 We can move the slider for the female voice to the left and the male voice to the right, so that it sounds like the female talker is off to the left and the male talker is on the other side. It is not necessary to move the slider all the way over, in fact it is often better to leave a bit of each track coming out the opposite channel. This is because, in nature sound from a person talking directly to your left or right will have sound wrap around your head (and bounce off things) and arrive at the opposite ear. If the listener was wearing headphones and all the audio was coming from only one side, it would sound unnatural. Here's an example with the settings changed for different channels. Another quick tip. 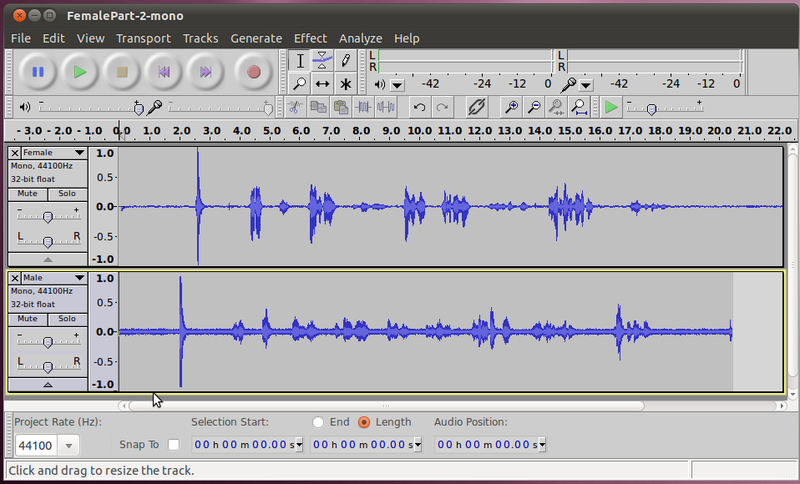 When the audio was recorded, the microphone used by the female picked up a bit stronger and her channel is a bit louder. To make them match each other better, the volume slider (the one with the "-" and "+") was lowered a bit for her channel. 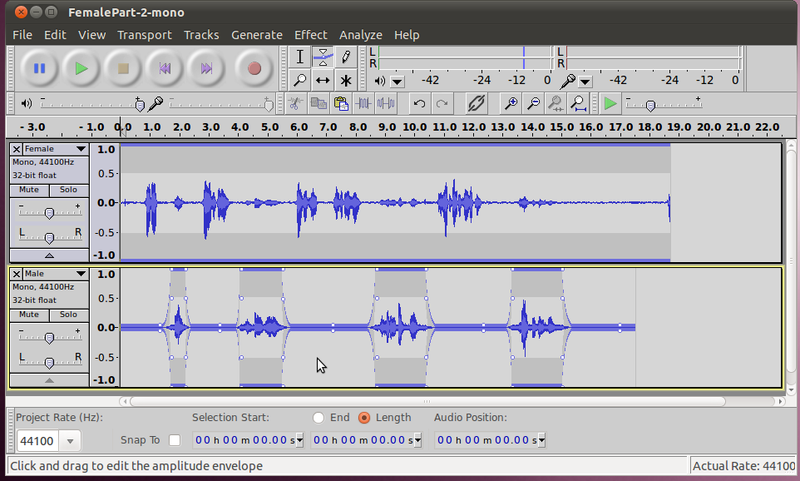 The other problem with this audio is that the male's microphone picked up a lot of background noise, and that needs to be removed, we'll work on that in the next section!